Our cooking club theme this month was “Recipes from your Grandmother”. 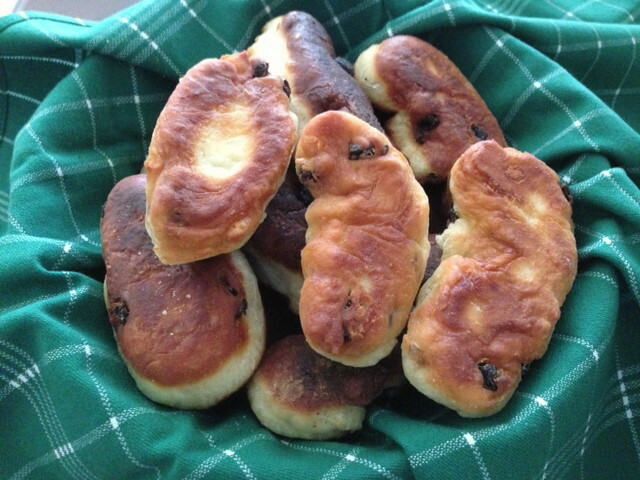 I decided to tackle a brand new recipe, my grandmother’s fried dough. This is not your typically local fair fried dough which is often flat, and perhaps even topped with tomato sauce. These are sticks of slightly sweetened bread dough, which you must dip in cinnamon and sugar. It’s never easy to work with yeast, but I was happy that the dough rose fairly well. The dough was a little sticky as I tried to shape it, but I did my best, and dropped them into a pan filled with about 1″ of oil. Because I wasn’t using a true deep fryer, they got flat on the bottom, but that’s OK. These were great fresh out of the pan, but almost stale 12 hours later so you need to serve them right away. If you’re having a party and decide to give them a try, this shouldn’t be a problem. Mix oil, sugar, eggs, and milk in a medium bowl. Add yeast, and 1 cup flour, and beat until smooth. Add another 2 c. flour and raisins, and mix and knead until smooth. Add more flour as necessary if dough is too sticky. Let rise in a warm place for 1 hour, or until doubled. Shape into sticks, and fry in deep oil. 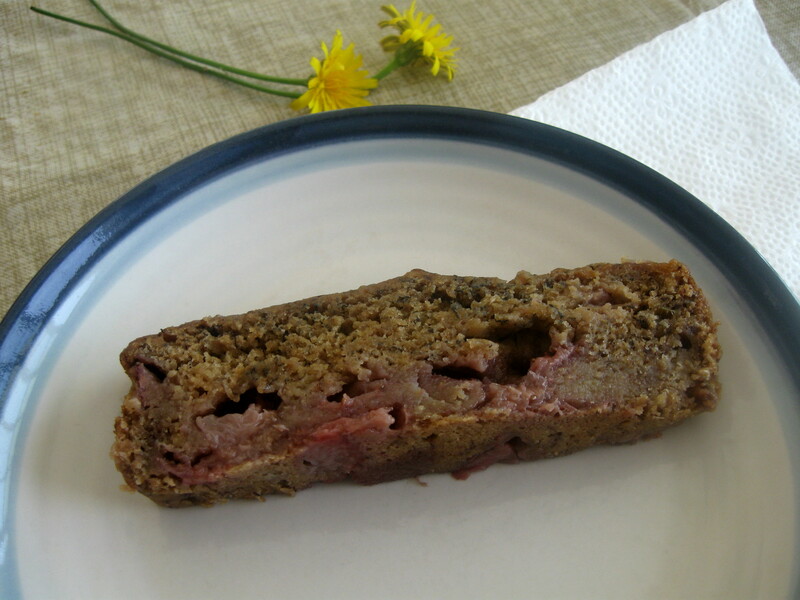 Strawberry season is in full swing, and I was excited to try this Roasted Strawberry Banana Bread from Skinnytaste. So excited that I think I ate half a container of strawberries while my Mom was cutting them up. But that’s OK, there were still plenty to roast. To make the recipe egg-free, we used Ener-G Egg Replacer. As you can see, the bread didn’t rise very well, but I am not sure if this was due to the egg replacer or another factor. Despite being a bit dense, the bread was still delicious. If I can keep a carton of strawberries around long enough, I might give it another try. St. Patrick’s Day is quickly approaching, and there’s a little leprechaun that’s allergic to eggs. So I set out to make our traditional Irish Soda Bread egg-free. There are so many egg replacements, but we chose yogurt for this recipe, and I think that was the right call. Because we used a commercially prepared buttermilk which was low-fat, I used nonfat yogurt. If you’re going to make the buttermilk yourself with skim milk, I would suggest low-fat yogurt. We used the buttermilk again to replace the traditional egg wash on top. The egg-free version tastes exactly the same, but the texture is a little different. The bread is a bit softer, with a finer crumb. It was still delicious, and now I need to bake another loaf for the big day! Preheat oven to 350F. Coat a 2 quart round casserole dish with cooking spray. In a large bowl, mix the first 5 ingredients (flour through baking soda). With a pastry blender or two knives, cut in butter until mixture resembles coarse crumbs. Stir in raisins. Stir yogurt and buttermilk in a small bowl. Stir into flour mixture just until flour is moistened. The dough will be sticky. Turn dough onto a floured surface, and with floured hands, knead about 10 strokes to mix thoroughly. Shape into a ball, and place in casserole dish. With a sharp knife, cut a cross in the top and brush dough with 1 T of buttermilk. Bake about 60-100 minutes, or until a toothpick inserted in center comes out clean. Although I love a good latte, I am usually not tempted by the bakery case at Starbucks. The major exception is their blueberry scones. There’s something about those scones that I really love, so I decided to try to make some at home that might be a bit healthier. I used this Strawberry Scone recipe from Chobani, and substituted plain yogurt for the strawberry yogurt, and blueberries for the strawberries. Many people have used this recipe successfully, but I needed to add a splash of milk to bring the dough together. I think if you use a fruit that has more moisture (like chopped strawberries) that might do the trick. Either way, I really liked these scones. They’re fluffier than the Starbucks version, and a little smaller of course, but make a nice treat. While I’ll still stop at Starbucks for my coffee fix, I can bring my own scone! In a large bowl, mix together flours, sugar, baking powder, and baking soda. Using a pastry blender, cut in butter until the mixture resembles coarse crumbs. Add in blueberries and yogurt. Stir just to combine. If more liquid is needed, add a splash of milk. Turn dough onto a floured surface. Fold dough on top of itself a few times – do not knead. Form into a circle that is 1-1 1/2″ thick. Cut into 8 triangles. Place each triangle on a baking sheet covered in parchment paper. Bake at 400F for 12-15 minutes, or until lightly browned. Last weekend, I had the urge to bake bread but got distracted and made Pumpkin Ginger Pecan Muffins. There were no distractions this weekend; I made something even better than bread! I made these Crusty Spinach Feta and Sun Dried Tomato Bread Rolls. There is nothing like fresh bread right out of the oven. The recipe from Sass and Veracity is based on a recipe from Artisan Bread in 5 Minutes a Day. The basic concept is that if you keep dough in your refrigerator, you can make bread easily whenever you’d like. That sounds great, but I don’t think it’s a good idea for me to bake fresh bread every day! Still, the recipe works well. I cut the ingredients in half and tried to clarify the directions in my version below. The process isn’t difficult at all; the hardest part is creating steam in your oven with a pan filled with water. The rolls were amazing – crusty on the outside, soft on the inside, and full of flavor. They would work well for either brunch or dinner, although I must say I really enjoyed one with a glass of wine. If you’re nervous about making your own bread, my advice is to jump in and give it a try. It takes some practice, but once you get going you’ll have your own bakery on demand. Mix yeast, sugar, salt, spinach, tomatoes, and feta in a large bowl. Place egg white in a liquid measuring cup, and add warm water for a total of 1 1/2 c. fluid. Add to mixing bowl. Spoon flour into mixing bowl. Mix with a wooden spoon just until the ingredients are combined. Cover loosely with plastic wrap, and allow to rest in a warm place for 2 hours. Prepare a baking sheet with parchment paper sprinkled with cornmeal. Sprinkle flour on top of the wet dough. Flour your hands, and pull pieces of dough the size of a baseball. Shape into a round, and place on the prepared parchment. Continue until all the dough is formed into balls. Allow to rest for 1 hour. Place a rimmed baking sheet on the lowest rack of the oven, and preheat oven to 425F. Add water to the empty pan. Place prepared baking sheet with dough on the middle rack. Bake for 20-25 minutes, until rolls are golden brown. Cool on a rack, and serve warm. Of course, I love to visit farmer’s markets and my local produce market. I really do believe in enjoying fruit and vegetables seasonally, and supporting local agriculture as much as possible. But I am not ashamed to admit that I also check out the discount produce bin at the grocery store. You do what you need to do. This week, I found an incredible deal: 10 very ripe bananas, packaged together and priced at just $1. This meant, of course, that I had to make banana bread. It seems a shame that I don’t have a single banana bread recipe on the blog. My grandmother made banana bread all.the.time and it’s always been one of my favorites. I decided to make this Crackly Banana Bread from Smitten Kitchen, which aims to make a bread that is more suitable for breakfast with fruit, whole grains, and less sugar. The “crackle” comes from uncooked millet. Now, I didn’t want to get a deal on bananas and then spend a lot on millet. But it was pretty cheap to buy just 1/4 c. of millet from the bulk bins at Whole Foods. I made a few changes to the original recipe, most notably using canola oil instead of coconut oil, and switching up the spices a bit. Everything worked out well, and I loved the crackle! This is a really moist banana bread, which supposedly keeps for a week. You could enjoy this banana bread as a treat for breakfast, perhaps paired with some nonfat plain yogurt, but I know my grandmother would be eating it in the afternoon with a cup of coffee. In a large bowl, mix bananas, egg, oil, sugar, maple syrup, and vanilla. Add baking soda, cinnamon, and pumpkin pie spice and mix well. Add flour and stir just until combined. Stir in millet. Pour batter into a 9″x5″ loaf pan coated with cooking spray. Bake at 350F for 40-45 minutes, or until a knife inserted in the center comes out clean. Allow to cool on a wire rack before removing from pan.